The Initiative Group of Independent Human Rights Activists reports that there are two meat prices in Uzbekistan nowadays, one that is declared and the actual one. 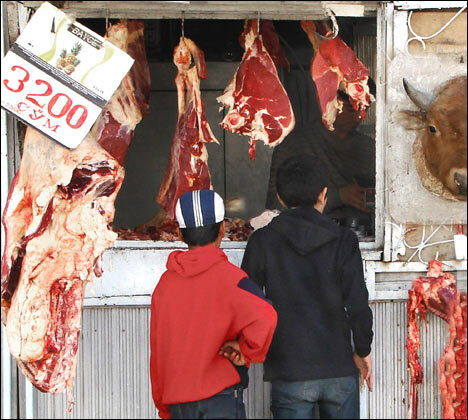 On August 26, Prime Minister Shavkat Mirziyoev informed Tashkent khokims (heads of districts) and local tax inspectorates that he wanted meat sold at 3,500 sums even though the actual market price was 5,500 sums. Scandals followed the order. Vendors refused to sell meat at under the market price and found themselves under pressure applied by tax inspectorates and the police. Fighting occurred. Vendors and tax inspectorates reached an understanding in September. The required price (3,500 sums) was put on price tags but beef remained available to customers at 5,500 sums all the same. Mirziyoev visited the marketplace near Chilanzar metro station on November 18. Accompanied by the usual retinue of minor functionaries, he decided to take a look at how his order was carried out. The premier stopped at the very first stall, bought beef (33 kg), and paid for it 3,500 sums a kilogram. The vendor was predictably agitated and calmed down only when officials of the local tax inspectorate accompanying Mirziyoev whispered in his ear that they would cover the difference. And so they did. Mirziyoev paid 115,500 sums for beef and the remaining 66,000 sums were paid by officials of the Chilanzar District Tax Inspectorate. All this window dressing is apparently supposed to buttress the impression that the economic policy of the Uzbek Cabinet is wise.